Alice Miranda Takes the Stage by Jacqueline Harvey. An Alice Miranda Book. Review: Look at this, mummy; All those beautiful dresses, and we're almost the same size. I'm sure she won't notice if one or two goes missing, Sloane said. The book, Alice-Miranda Takes the Stage by Jacqueline Harvey is a tale about Alice- Miranda, Millie, and Sloane. This story tells their adventures at Winchesterfield-Downsfordvale Academy for Proper Young Ladies. This is the latest book in the series. The girls of Winchesterfield-Downsfordvale Academy for Proper Young Ladies start their school year when a new girl, Sloane Skyes, comes to school. Alice-Miranda is a rich girl who is kind and generous. She's kind to Sloane, but Sloane doesn't appreciate it. She has been at the school for several years. Many girls think Sloane is keeping a secret. Sloane's mother, September, wants Sloane to become friends with the wealthy kids. Sloane does have a secret, but she doesn't want anybody to know. Accidently, Alice-Miranda meets a new friend, Henrietta, who everyone in town thinks is a witch. Who could she be? Meanwhile, September and Sloane devise a plot. Will Alice-Miranda save the day before it's too late? 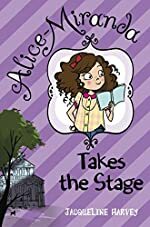 Alice-Miranda Takes the Stage is a tale of delight that would be appropriate for girls ages 8-11. An example of the feminine plot is "A new girl that's lovely. I can't wait to meet her. What is her name?" Anyone older than 10 or 11, might think the vocabulary is too easy. For instance, a character states, "Oh, I hope not. You know I can't stand horses. That won't be any fun at all." I enjoyed the book, even though it would switch the character's points of view often. That affected the story because I would be reading in Alice-Miranda's point of view. Then, in the next chapter, the author would switch to Sloane's point of view. When I realized this, the book was easier to read. I would guess ways to solve the mysteries. The characters have many different personalities, yet they still get along. I can relate to this. An example of the kind or abrupt language of the characters is "Are you lost? You're Sloane, aren't you. My name's Alice-Miranda Highton-Smith-Kennington-Jones and I'm very pleased to meet you." Sloane said, "No, I'm not lost. I'm just waiting for, what's her name, Dinka or something." This dialogue reminds me of my friends because we are all different in the way we respond to situations. This book had me on the edge of my seat. I couldn't wait to find out if September would get her way, or if Alice-Miranda would make things right. I liked the way the character's perception of others changed throughout the book. The author would have me thinking one idea, and then the plot moved in another direction. I certainly enjoyed Alice-Miranda Takes the Stage. The adventure, mystery, and dramaÉand I mean a lot of drama, will entertain upper elementary and middle school girls! Review written by Madeline (6th grade student). We would like to thank Random House for providing a copy of Alice Miranda Takes the Stage for this review. Have you read Alice Miranda Takes the Stage? How would you rate it?